The FP715 Si two-channel full programmer has separate Heating and Hot Water outputs operating on completely independent time bases for maximum flexibility. The FP715 Si can be configured by the installer at time of installation to provide 7 day, 24 hour, or 5 day/2 day operation and to provide either 2 ON/OFF's or 3 ON/OFF's per day, allowing the time control to be tailored to match the specific requirement of the consumer. Additionally the programmer can be set for either 'pumped' or 'gravity' hot water. The wallplate used follows the industry standard pattern, as used by many of the other time control manufacturers. This allows for direct replacement often without the need for re-wiring. An additional range of accessories allow the FP715 Si to be used in other upgrade situations where the unit being replaced is larger than the new unit and a decoration scar would normally have been left. 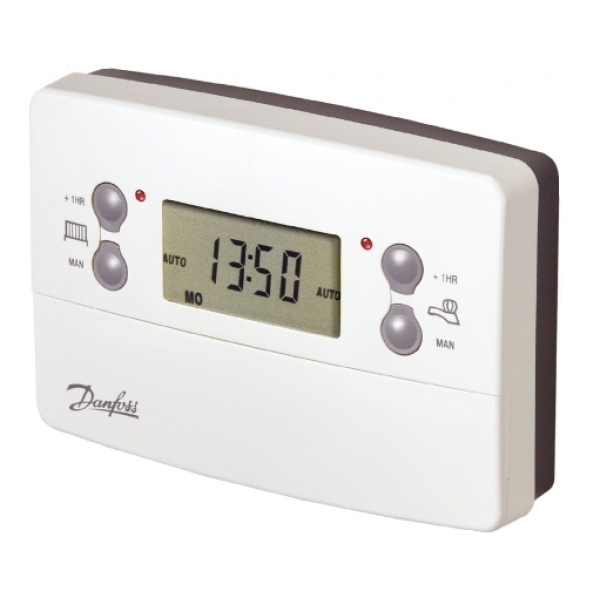 Additional features such as service interval timer, convenient user overrides, built-in ready-to-use programmes, a day programme copy facility as well as a stylish, compact design and easy to read display make the FP715 Si the simple answer to all heating and hot water requirements.